Among the many challenges that Urban Planning faces in developing countries none is more readily solved and yet more often ignored than the perception and aspiration of belonging to something meaningful. Mega developments, utopian visions and unfulfilled promises mired in bureaucracy have put a bad taste in the inhabitants of major 3rd world cities. A city designed around the inhabitant’s aspirational needs is far more significant and has more longevity than any other smart city urbanistic trend. So what is the correct approach and desired perception needed to achieve a better quality of life by incorporating aspiration as an urbanistic design element? This project case study, of a 2,400 acre development called New Dhaka, in Bangladesh, proposes an answer to such a question. Although ‘smart cities’ are undeniably the wave of the future, transplanting this technology directly to developing nations is a mistake. When you compare the wealth and stability of today’s model smart cities (i.e. Songdo, Masdar, Vienna etc.) to major developing cities (Addis Ababa, Port-au-Prince, Dakar etc.) there is a chasm of differences and realities that will not allow current smart city technology to flourish. We cannot include smart sewers that analyse a city’s public health because that assumes that everyone has access to clean food & water. We also cannot include a bike-share system since not everybody has a permanent address to which they can register a credit card. Lastly, and perhaps most significantly, a smart city requires a ‘smart government’, translation: an open minded, forward-looking, efficient and transparent functioning governance. 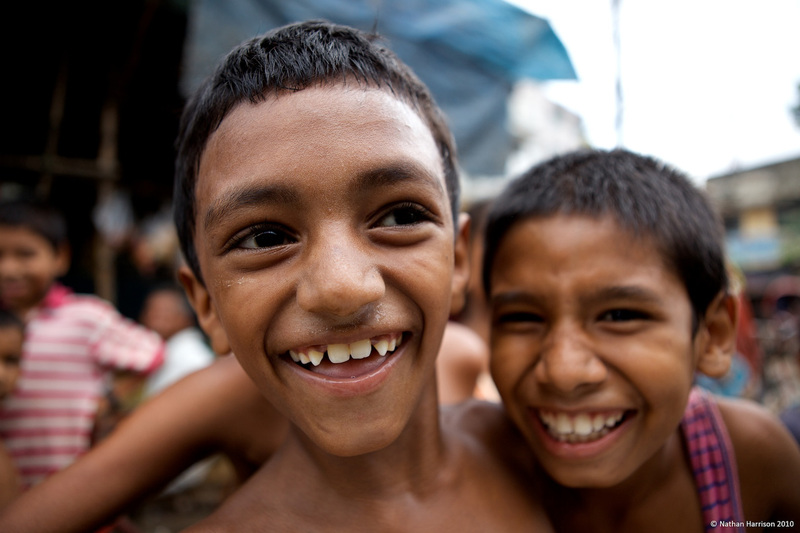 A ‘smart city’ in a developing country needs to be a ‘smart indigenous city’. In 2011 we were contacted by one of the largest private land owners in Bangladesh (Bestway Land Properties Ltd.) to help develop such a project. The founder of this company, a self-made man, had lofty goals for his company and the people of Dhaka. Riding the wave of growth that has been spreading throughout several emerging nations, he wanted to build a new city on the periphery of the capital. Having no real infrastructure to build into within Dhaka (power, water, sewage) he chose as many other new cities popping up around the globe have, to build new. He accumulated 3,000 acres with an additional 2,000 in reserve along a newly constructed highway linking it to the international airport in Dhaka and less than 15KM from downtown. Timing the boom/bust in real estate today he stands ready with several thousand small investors to begin construction. When we first arrived in Dhaka, we thought that we carried with us most of the answers to our client’s vision in the form of a sophisticated ‘smart city’ concept. However, after one week of being on the ground, of talking and visiting with our counterparts, we realized that nothing could have been further from the truth. The positive part is that Dhaka, and Bangladesh, is growing. In fact, the World Bank predicts that Bangladesh’s GDP will grow at an astonishing 6.7% in 2016, making it one of the world’s fastest growing economies. Just to put that in perspective, the European Union is expected to grow below 1% in 2016. Also the median age in Bangladesh is 26 years old, meaning it’s a young and strong population ready to take the nation forward for many years. Again, to put that into perspective, the median age in the European Union is 42 with a negative birthrate to boot. The negative part is that Dhaka is growing in an unplanned and haphazard way at best. The streets are busy with commerce, with unlicensed merchants vying for sidewalk space to sell their wares, fruits, homemade food, recycled electronics, furniture, clothes and even pop-up butcher shops. Needless to say, none of this is planned or remotely close to code, it just happens organically, including the bribe the policeman takes to allow it to continue. There are parts of Dhaka that are free of this, the wealthy areas, but by and large most of Dhaka is unplanned, unorganized and every man, women and child for herself. Then there is the traffic that is paralyzing at times, with crowded buses scrapping with cars, rickshaws and pedestrians for a small clearing in the roadway. People bravely cross the street, even highways, at any point that is convenient to them, expertly dodging oncoming traffic in a seemingly ceaseless game of dare. Stop lights, the handful that exist in a metropolis of almost 18 million people, seem not to matter even on the odd-chance that they are working. Power and phone lines weave throughout the city looking like an endless spider’s net, with coiled lines attached on top of each other. Although the nice parts of town have enclosed sewers, the rest of the city is a mix of semi covered to fully open sewers. Sprinkled amongst all this is an unusually high number of dormant construction sites half way through completion, leaving many structures half built. Now add to this picture the fact that Bangladesh held the unwanted honor of being the most corrupt country in the world, according to the Global Corruption Index, from 2001 to 2005, only to be recently displaced from the bottom when the list was expanded to include countries such as Haiti and Chad. Also, to add insult to injury, The Economist ranked Dhaka as “The Least Livable City in The World” in a 2012 survey. As an urban planner, the impact of this reality forces you to discard whatever presupposed 1st world design solutions you carry with you. Knowing full well that our job description does not include government or city policy, we are left with having to rethink a city from a new set of minimum values. The idea of placing magnetic sensors under parking spaces to alert drivers on their smartphones to an available space is no longer relevant or even part of this reality, instead we have to start with the basics, with hope and aspirations. How do you design hope, how is that possible? We started by studying our target market, by listening and researching, and we learned a lot. Citizens of Dhaka are not different from any other citizen in the world, they want to feel part of their city, and they want to be part of something meaningful. How we feel about a place greatly influences the perception, both internally and externally, of the city we live in and its success. So we designed something that allows people to belong to something bigger than themselves. At the core of this simple statement is the concept of belonging, something that is sorely missing on the streets of Dhaka. Belonging is an emotional need that has giving and receiving at its core. In branding terms that is our ‘positioning statement’, that is our differentiator. All design decisions for our city going forward will be checked against that statement. How can our city grow while also help others? Additionally, the growth of blogs and social media have become the central point of information distribution enabling an ever-growing pool of participants to both benefit and contribute in knowledge. It is with this spirit that the New Dhaka Open Source (NDOS) is formed to help property owners build by offering a central point for information, discussions and an always growing collection of buildings documents for them to use, as they like, for free. The construction plans will be offered as printable digital documents (pdf or similar) and will have been approved for publishing prior to being posted in the open library, similar in concept to how Wikipedia works. The user has the freedom to use and modify the construction documents as long as it does not alter its structural elements. If the user adds or modifies the construction documents in a significant way, they will be added to the NDOS library upon filing for permit. The user has the freedom to redistribute the file to anyone for free, anywhere in the world. The user cannot sell or profit from a file that has been downloaded from the New Dhaka Open Source library. Reduce the cost of construction by reducing material waste and design mistakes. Reduce the time required in the building process. Increase life / safety standards. Compliance to Bangladeshi and New Dhaka building codes. Create a more knowledgeable and informed citizenry. All of the latter points are also things that will have a significant positive impact on the economy of the city. Owners or builders will still be required to submit plans for building permits regardless if downloaded from NDOS or not. However, non-altered NDOS plans will process much faster. Our city will also participate in a growing partnership of ‘open source cities’ around the world that are starting to share information and solutions that they have successfully implement in their own city. Open source is agreeing to be part of a bigger pool of information, one in which New Dhaka will take from other leading cities as well as give back to them. In a very timely way, this year’s Pritzker prize winning architect, the Chilean Alejandro Aravena, has recently announced that he will make available for free a handful of his low-income housing projects which, coincidently, seem almost custom made for the necessities of the Bangladeshi homeowner [fig 1.]. Fig 1. 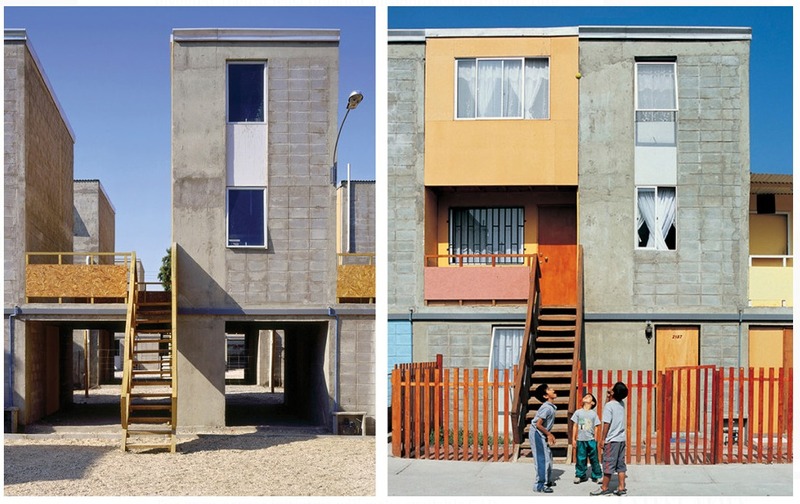 From Alejandro Aravena, free online design documents for low income housing. It’s a great start to our open source library. NDOS is the first vital step in raising the aspiration of its new residents, allowing them to achieve something that they would otherwise not have been able to do. This is the foundation of our city, help yourself while helping others. The reality of the environment in Dhaka is front and centre. While we are concerned with the impact of rising sea levels, we have to mitigate this against the reality that Dhaka is estimated to be growing by 300 to 400 thousand people a year (United Nations estimates and projections). Not to build is not an option. We just have to build smarter. One of the major concepts behind our city is the New Dhaka Spline (NDSpline), proprietary to Bestway Group, which is an integrated sidewalk, sewage, storm water, electrical and communication lines system that is easy to build, install and maintain. Fig 2. Section through the New Dhaka Spline system. The NDSpline [fig 2.] is an easily expandable prefabricated modular solution to the critical component of proper sewage, water and power distribution. Once installed there is no further need to excavate for maintenance or repair, eliminating road closures that snarl traffic and services for the city. 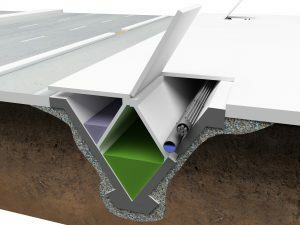 The NDSpline also removes the need for manholes since all the services are easily accessible under the modular panels of its sidewalk. Because the NDSpline is adjacent to property lines, and not in the middle of the street, it makes linking new construction into the utilities easier and more economical. Ultimately, the NDSpline can come in different sizes, such as for avenues and secondary streets, so as to handle the proper load volumes. The NDSpline can also be exported to other cities, such as Dhaka itself, where there is need for efficient infrastructure distribution. Covered walkway and street crossings. Covered walkway and Market Place aspects of the NDWalkway will be covered in the sections 2.3 Compact Growth and 2.4 Business Focus respectively. The Rain Harvesting aspect is, however, very much related to the environmentally sound aspect of this section. According to the World Health Organization (WHO), 60% of the population in Bangladesh is exposed to unsafe drinking water and the problem continues to be compounded by rising salinity in the water, empty wells and the natural occurrence of arsenic in the ground water. Although the local government is trying to improve rainwater capture, the progress is far too slow and on too small of a scale. To help mitigate this, we are building the canopy on the NDWalkway to act as a large rain catching surface to funnel the rain water into large reservoirs. We propose using the current water filtration technology in use in India to filter and distributes the harvested water through public dispensing machines, similar to a bank’s ATM. Fig 3. The NDWalkway, with the rain harvesting roof and water distribution point. Bangladesh has learned lessons from past disasters and has developed a relatively effective flood mitigation policy and disaster control framework. New Dhaka will conform to all the latest flood plain zoning and 100-year flood building recommendations, including not allowing residential living quarters on the ground floor, which will save the loss of property from the yearly monsoon flooding as well as minimize the disruption of the daily lives of those affected. The urban planning will maximize cross-flow ventilation, taking advantage of naturally occurring winds and optimizing sun angles. While we cannot solve Bangladesh’s energy deficit, we will zone in requirements for solar panels, both for home use as well as public water filtration. We are working on a clever way to build out new waste water sewage so that it is modular and quick to install and are also looking into incorporating city-wide water filtering technology that is both affordable and realistic to guarantee our citizens clean water. Being environmentally sound and focused is the most visual and direct way of helping others, it is a daily reminder that we care about more than just ourselves. Also known as ‘Smart Growth’, it is the urban planning concept, in line with the International Guidelines on Urban and Territorial Planning (UN, Habitat 2015), that concentrates the city in easily walkable areas while reducing infrastructure sprawl. There are many advantages for a compact growth model for New Dhaka, which include communities that grow together over time creating meaningful socio-economic relationships. Compact growth also creates centres, or nodes, that become catalyst for businesses and a natural center for the town. Smart growth is based around the concept that the city grows organically in all directions based on its trade, geography, social and economic forces, letting the city expand at its own pace with clear zoning that controls the expansion of infrastructure, buildings and opens spaces. 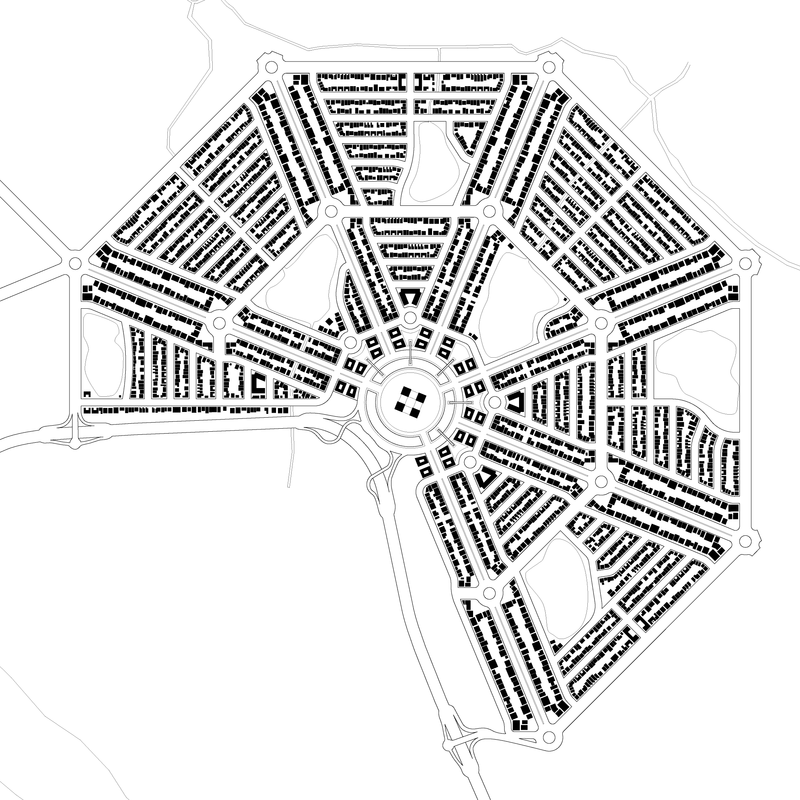 Each node will have autonomous sectors, with local residential, commerce and civic capabilities [Fig 4.]. The compact growth node based layout significantly minimizes distances for commuting and will allow us to implement and efficient Rapid Bus Transit system (BRT). The BRT will be focused on the higher density main avenues and will not face any stoplights along its route because it will always be turning left thanks to the clockwise round-about. Additionally, the main avenues will have dedicated sections of the road for non-motorized vehicles. Fig. 4. Central node of New Dhaka. In New Dhaka walking will be the preferred means of travel, the interior areas of the node place emphasis on pedestrian connections, by placing key civic components within acceptable distances and with covered walkways along major arteries. Our zoning would mandate foundations that can withstand future building of additional floors, so that as a family expands their property can grow respectively. According to Arif Hasan, a visiting fellow at the International Institute for Environment and Development, this would only add 15% to the initial cost of the foundations. In order to achieve the goal of strong connected communities within the main node, mixed-use zoning will play a key role in the compact growth model, letting low income families live-work in the same place while middle to high income families can commute to work. Compact growth is designed to grow as the city grows, not taking any more than it needs along the way, respecting existing neighbours as well as their environment. Respecting yourself as you respect others, a continuation of our central theme. There is no meaningful successful and independent urban planning without the ability for the city to generate and sustain its own economic existence. Our economic foundation is that all levels of commerce are welcome and encouraged to flourish, from the street vendor to international firms. 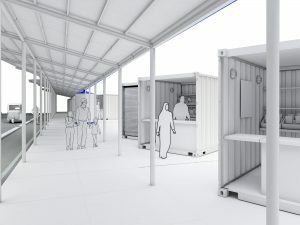 As per the Adis Ababa Action Agenda of 2015 (from the United Nations Third International Conference on Financing for Development), we see this urban design opportunity as a “catalyst for sustained and inclusive economic growth that provides an enabling framework for new economic opportunities”. Investing in youth. There is a strong competition amongst cities to attract the young and tech savvy workforce for obvious reasons, they offer the most promise for economic growth. It is with New Dhaka’s stated commitment to Open Source Design that we plan to attract and retain like-minded young tech workforce. Investing in locals. We are also cognizant of the impact of street merchants to the local economy and we welcome them instead of zoning them out as eye sores. 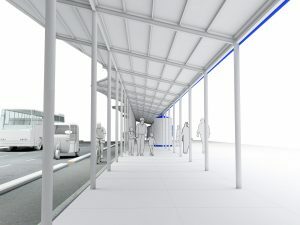 New Dhaka will incorporate a street merchant friendly modular solution in its NDWalkway [Fig 5.] 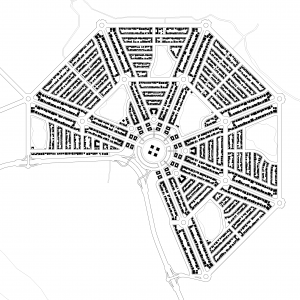 and plazas, with access to both electricity and water. In coexistence with these two levels of commerce we plan on sequentially building an international business hub at the center of the main node. Fig. 5. 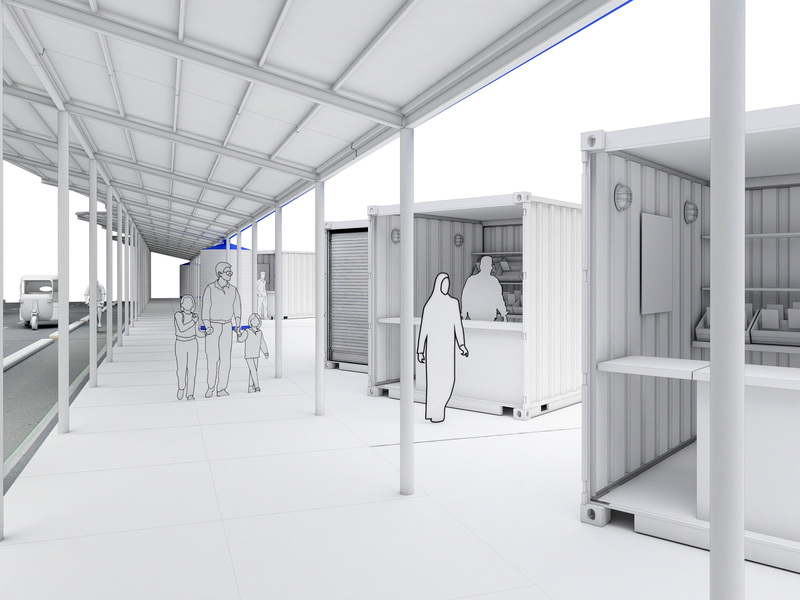 Prefab market units along the NDWalkway. The premise to all of this is that big business will want to be here because the young workforce, empowered by the altruistic vision of the city, will be here. It is in the human spirit to feel connected to a bigger group, to belong, and this is currently reflected in the market place by a new business trend that is quickly gaining more popularity; the one-for-one business model. It is a perfect mix of commercial and social value, each reinforcing the other. The premise is simple, a company promises that for every product sold they will donate an equal one to charity. Although we cannot replicate that when the product is a city, we can certainly do something proportionally, such as for every ten units of new NDSpline that is built in our city, we will build one unit of NDSpline in Dhaka. The important part in this formula is the knowledge of having helped, that as a result of us building New Dhaka, Dhaka has also benefited. It works at the level that it allows our citizens to feel as though they are part of something bigger than themselves. This implies a relationship with our city that is bigger than shelter alone. We will also form the New Dhaka Urban Research Institute (NDURI), an urban planning research laboratory that will track all the urban aspects of New Dhaka for the purpose of optimizing and improving its function. Emphasis will be place on local researchers, although foreign visiting researchers will be welcome. Additionally, NDURI will host an annual international conference on urban planning for developing countries called DhaCon. Bestway Group Inc. will fund and promote the event. In short, New Dhaka wants to participate and contribute to the conversation of our urban future with real interventions. The beauty and immense potential of one of the largest cities in the world is currently lying dormant. With the onset of current technology and instant communication, we can build a city that unleashes the potential of this industrious and benevolent population. We don’t need glossy brochures with visions of a Western-style living on the shore of the Ganges Delta, there are already plenty of those. What we need is a city that takes advantage of the aspiration of a population to feel good about themselves by being part of something bigger than themselves. With belonging comes a sense of identity. To say “I live in New Dhaka” will be a status symbol not of how wealthy you are but of how much you have made a difference. I gratefully acknowledge the work done by Programme Committee and Lecturers of the International Conferences with Exhibition S.ARCH “Sustainable Architecture” for efforts done for the success of this event. I would also like to acknowledge the stewardship of M.D. Mizanur Rahman, Chairman of Bestway Group in Bangladesh, and his staff for the vision required to do develop Purbachal Bestway City – New Dhaka.